During the summer months when the swimming pool is open, you might hear some family members or guests complaining about their hair turning green or their swimsuits having a green tint. You may be quick to blame the chlorine, but the culprit is typically dissolved copper in the pool water. Copper can enter the pool in many ways, including when you add water. It is more likely in rural areas where well water is used to fill the pool and in regions where the local geology has a lot of mineral copper in the underlying stone. A greenish tinge to swimming pool water may indicate the presence of dissolved copper. 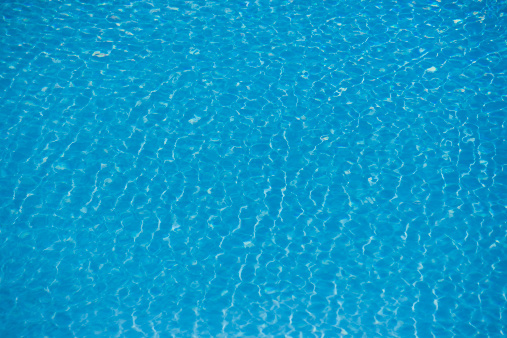 In a swimming pool, copper can build up after time because it is not removed by the filtration system. Fortunately, you can prevent copper from building up through the proper use of chemicals. Test the pool water using copper test strips. Dip the test strip in the water for five seconds. Remove the strip from the water, and shake once. Wait for about 15 seconds and compare the color on the strip to the color chart that comes with the kit to see if there is copper in the water. Ideally, the level of copper should be zero. Test the pH in the pool. To counteract the copper in the pool water, the pH should read between 7.2 and 7.3. Test the calcium hardness using a calcium test strip. 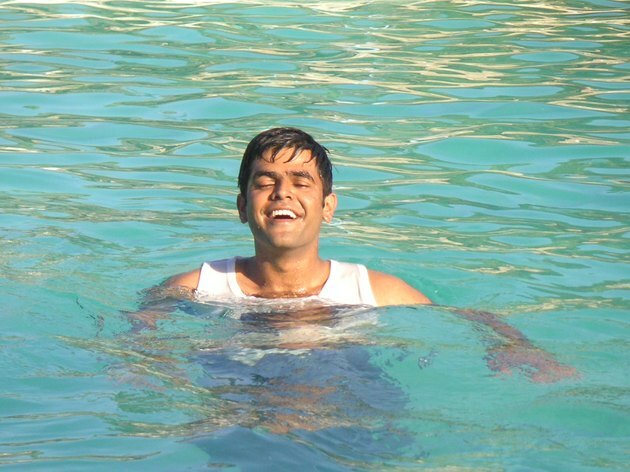 The hardness level needed to fight copper buildup in the pool should be 350 parts per million. If the pH needs to be adjusted or the calcium hardness needs to be raised, continue to the next steps. Turn on the pump so it is filtering. Allow the pump to run for at least eight hours. Raise calcium hardness by using calcium chloride. Generally, keep the calcium hardness at about 250 ppm. Use 2 ounces of calcium chloride per 1,000 gallons of water to raise the calcium hardness 10 ppm. per 1,000 gallons of water. Sprinkle the powder into the deep end of the pool. Lower the pH to 7.2 or 7.3 using muriatic acid. Add 1 gallon of water to a bucket. Add the correct amount of acid to the water in the bucket. Pour the solution in the deep end of the pool, keeping it away from pool walls and fixtures. muriatic acid per 1,000 gallons of water if the pH is between 7.6 and 7.8.
of acid per 1,000 gallons of water to lower the pH if the test reading was 7.8 to 8.0. Raise the pH if the reading is lower than 7.2 by adding soda ash, pouring it into the deep end of the pool. of soda ash per 1,000 gallons of water in the pool if the pH is 7.0 to 7.2.
of soda ash per 1,000 gallons of water in the pool if the pH test reading is 6.6 to 7.0.